The origin of the Irish Wolfhound has been lost in antiquity, however, from illustrations dating back to 1400 BC we know that the Celts had huge hounds. Irish mythology, legends and sagas abound with the exploits of this ancient breed. This dog was the companion of kings - whether at war, on the hunt or just by the hearth. History tells of many hounds being sent to the royal houses of both Europe and Scandinavia. The breed has also come close to extinction. 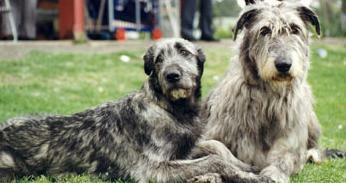 Irish Wolfhounds can live up to 8 years of age. 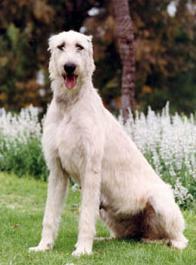 The Irish Wolfhound is often called the "gentle giant" of the dog world. Its proud bearing, quiet dignity and intelligence are just some of its many wonderful characteristics. This is definitely a family dog with an incredibly affectionate nature, which thrives on human companionship. Regardless of whether you are looking for a Wolfhound with show potential or one as a companion and family pet it should be physically and temperamentally healthy, exhibiting the friendly even disposition that is essential to its character. The Wolfhound will live happily with cats, rabbits and other domestic animals if introduced to them as a puppy - however, one must always remember that this dog is a sight hound. 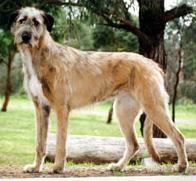 Raising a puppy that grows as fast as a Wolfhound requires special attention to diet and exercise. A balanced diet is essential to support the rapid growth rate and due to its rapid growth, a puppy's exercise should be restricted until it is nine to 12 months of age. Be especially careful not to let your puppy jump into, on to or out of cars. The breeders will be able to supply you with a suitable exercise regime. A small back yard is sufficient as long as it is kept clean and the dog is walked at least once daily. Some Wolfhounds like to dig large holes!